Only a handful of directors know atmosphere the way Akira Kurosawa does, only a handful. Yojinbo opens with a tracking shot of a ronin samurai walking down a dusty road. The camera wisely stays behind the samurai, played by Toshiro Mifune, so we cannot see his face or expressions. This samurai is desperate. Mifune has no master and no money. Kurosawa doesn't let you see his desperation, instead focusing on the back of his head and his profile to set up one of the most memorable characters in cinema history. The film has been copied many times, its practically the most influential film of the modern action genre. Yojinbo isn't action packed however, Kurosawa takes his time setting up characters and plot. The fact that this masterless samurai has deep compassion for strangers is different than most modern action movies alone. 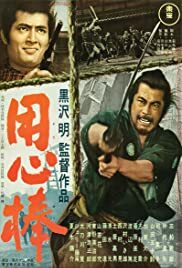 Toshiro Mifune is magical in the lead role. His presence is felt all throughout the film even when he isn't on camera. All film buffs should watch this film, it is a perfect example of a director and actor with confidence in their craft. 120 of 131 people found this review helpful. Was this review helpful to you?